These are the original owner's manuals in PDF format. They have everything the real manual has. To save these to disk, right click the links and pick "Save Target As..."
More technical manuals. I recently added the ADS II manual which will be useful if you have an SL600. "The WIS is woefully incomplete regarding this system, as is alldata. For the most part, ADS-I diagrams and components are shown, and are mis-labeled as ADS-II. This creates a huge problem with shops not knowing what they're doing. Even the bleed points shown in WIS are not accurate." "Steve Brotherton was apparently aware of a german-language version of this thing and managed to track the english one down, so now I have come into possession of the entire 162-page ADS-II factory manual. This material is pre-labeled for insertion in WIS, and was apparently slated for inclusion, but for whatever reason MB never actually did put it in. So accordingly, 95%+ of this is not found in WIS."
If you have any doubts, you can do a WHOIS lookup on the domain above to verify that it's owned by Mercedes-Benz USA, LLC. These are great places to turn to to find information and meet people with similar cars. These are links which have answers to frequently asked questions. The links direct you to online forums with information. Andrew Noakes (2004). Mercedes SL Series: The Complete Story. The Crowood Press. Pages 125-148. Hermann Ries (2009, Fall). Simply beautiful. Mercedes-Benz Classic. Pages 76-79. [Uncredited] (1989, January / February). World Premiere For New SL. The Star, Volume 34, Number 1, Page 21. Michael Cotton (1989, May / June). New SL Stars at Geneva Auto Show. The Star, Volume 34, Number 3, Pages 48-51. Frank Barrett (1989, July / August). 1990 300SL & 500SL. The Star, Volume 34, Number 4, Pages 22-29. Frank Barrett (1989, November / December). Mercedes-Benz for 1990............. The Star, Volume 34, Number 5, Page 36. Frank Barrett (1992, November / December). 600SL Leads 1993 Models. The Star, Volume 37, Number 6, Pages 46-47. Frank Barrett (1993, January / February). Truly Grand Tourers, The V12 Coupes & SL. The Star, Volume 38, Number 1, Pages 34-37. Ian Fraser (1996, May / June). Driving 40 Years of Big SLs (Part II). The Star, Volume 41, Number 3, Pages 48-51. [Uncredited] (1997, May / June). Factory News. The Star, Volume 42, Number 3, Pages 36-37. Jim McCraw (2000, July / August). SL600 Nearly Grabs One Lap of America. The Star, Volume 45, Number 4, Page 42. Brian Clifton (2010, July / August). Buyers' Guide - R129 Roadsters. The Star, Volume 55, Number 4, Page 56. David Sutherland (2006, January). Black beauty. Mercedes enthusiast, Issue 51, Pages 58-65. Tim Slade (2006, April). Macho Man. Mercedes enthusiast, Issue 54, Pages 46-51. Ian Kuah (2007, June). Original Sinner. Mercedes enthusiast, Issue 68, Pages 36-40. Eric Richardson (2009, March). First In Line. Mercedes enthusiast, Issue 89, Pages 36-42. David Sutherland (2010, August). V Almighty. Mercedes enthusiast, Issue 106. Chris Eckermann (2011, March). A Green Dream. Mercedes enthusiast, Issue 113, Pages 96-97. Karl Middelhauve (2011, May). Dream Come True. Mercedes enthusiast, Issue 115, Pages 86-88. David Sutherland (2011, July). More Than Metal. Mercedes enthusiast, Issue 117, Pages 66-70. Sooner or later, the lighting in your center AC vent is going to go out. These lights specifically light up the white lines over the vent adjustment knobs and the blue push button on the vent. Instead of replacing the bulbs, the dealer suggested I replace the unit at a cost of over $1000. It took me some digging, but I found the replacement part number for the bulbs. There are two bulbs (see picture) and a third bulb if you take the unit out (this lights up the arrow on the push button for the eyeglasses case). One reader sent in a note regarding this part... Part number has been changed to 072601012230. He also notes that this part may not fit 1990 - 1992 models. You can easily upgrade the appearance of your R129 by installing genuine AMG Pedals. I was made aware of this by BenzWorld.org R129 forum moderator Lynns. 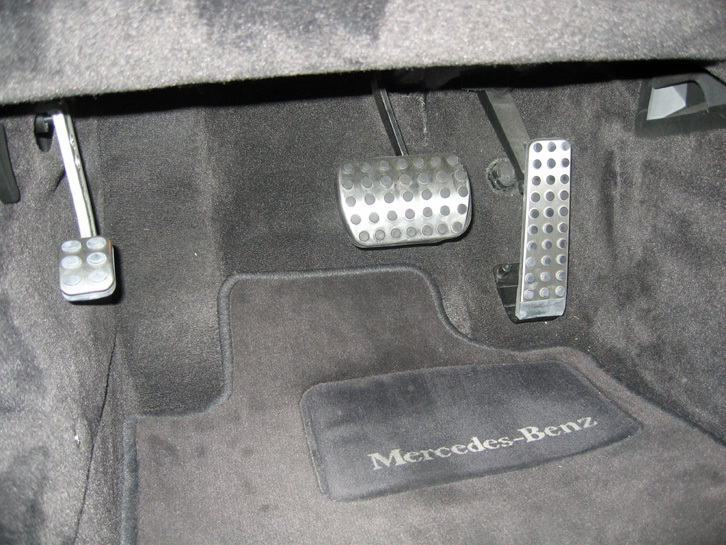 The emergency brake and brake are both essentially covers you can slip off to replace. The accelerator is easily swappable also. In the US, unless you have the projection headlamps, your car will come with ugly ADOT compliant headlamps. There's a plastic bezel around the entire lamp that looks stupid and the actual quality of the lights are horrible. It's very difficult to see at night time. Good news it that it's easy to swap these out. I printed out the job from the service manual and it took me about 2 hours. 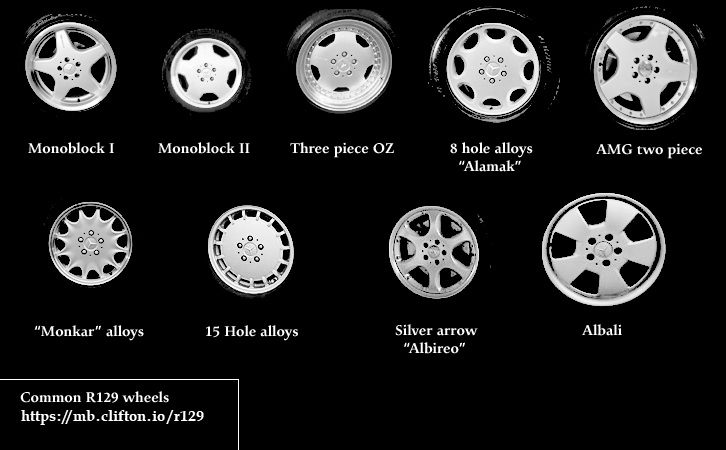 You can buy the parts from Adsitco, click here to view them. 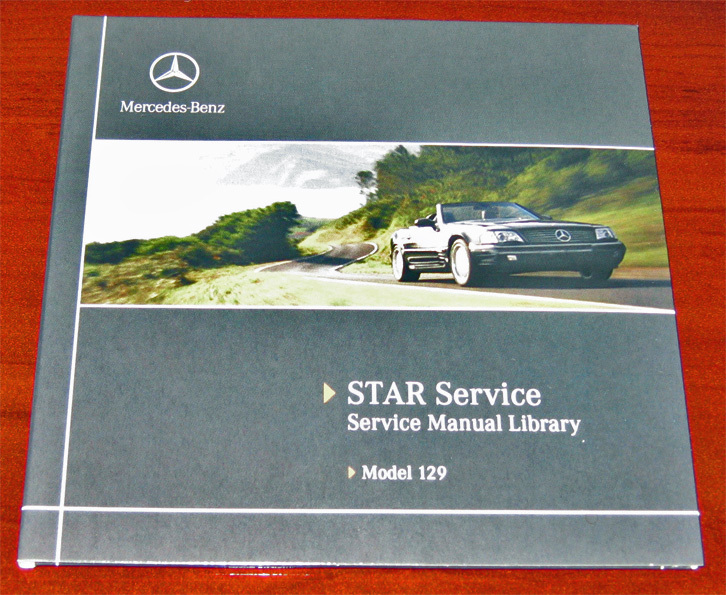 When in doubt, you can order the official R129 STAR Classic Service Manual Library on DVD. You’ll need a Windows machine to browse the content. 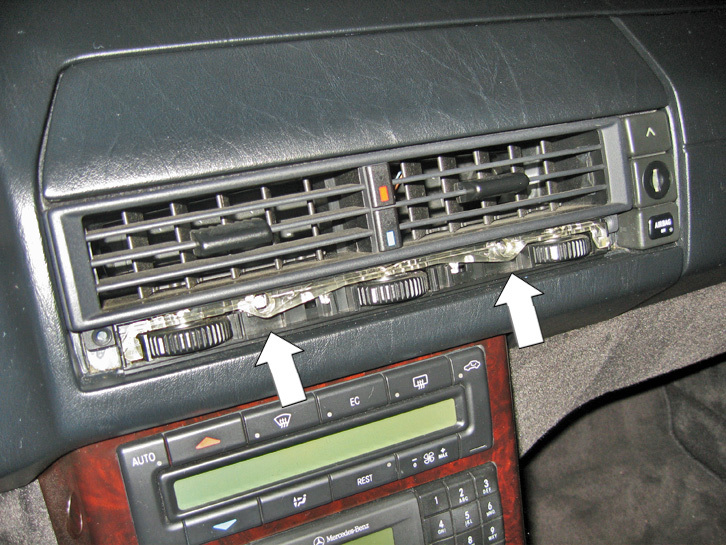 When you pop the DVD in, you can see step-by-step instructions for removing or replacing parts. For the folks that aren’t scared of buying genuine parts and doing service themselves, this is a must have. This DVD is good for US models 300, 320, 500, and 600. This DVD is no longer available from MBUSA. However, the Mercedes-Benz Classic Center now has inventory on hand. Please contact the Classic Center at 1-866-MB-CLASSIC(1-866-622-5277). The R129 is the fourth generation of the SL and is my favorite of the series. The 300SL Gullwing and 300SL roadster are beautiful, but they are a bit old for my tastes and I also don’t have pockets deep enough to buy (or maintain) them. The 113-Pagoda and 107-body SL are without doubt classics... but they don't have a lot of power and I think they are dated in many ways. I believe the 129-body SL offers a great compromise between power, modern technology, and the comfortable cruising you’d expect from an SL. You can actually fit golf clubs in the trunk; I’ve actually managed to fit two full golf bags in there! You’d have a hard time squeezing a cooler into an R230. The panoramic roof option on the 129-body is amazing; it offers ridiculously large views of the sky, much bigger than the panoramic roof on the R230. With later V8 models which feature the M113 engine, you also have a lot of supercharging options. It’s essentially the same engine as what’s in the R230 until the SL550 came out for model year 2007. This guide is my attempt at helping folks who love the R129 or are interested in buying one. I've collected information from various sources and wrote most of the guide myself. Bud Cloninger, MBCA Desert Stars section President and owner of MB Motors here in Phoenix Arizona, has also helped a lot by contributing content. I've tried my best to note where credit is due. I hope you all will find this information useful. If you have any feedback, please contact me. Thanks for taking the time to check this out! So you finally find a car in the newspaper, online, or for sale at a dealership. Here are the most important things to keep in mind while you are examining the car. Does the car have a wiring harness issue? If the car is model year 1993, 1994, or 1995 more than likely there was or will be a wiring harness issue. It’s a known problem but a recall was never issued. Repairing this can cost several thousand dollars (unless you do it yourself; parts cost roughly $500 - $700). If you are considering a 1993 - 1995 model year and can’t verify if the harness was replaced, take the car to a good Mercedes-Benz mechanic. Someone that has worked with these cars a lot should be able to quickly tell and give an estimate if the harness needs replacement. Does the car have a wind protection screen? Starting with model year 1993, the wind protection screen (also called a “draught-stop”) is standard equipment. The windscreen snaps onto the roll bar and helps provide a super quiet ride when you have the top down. If the car has one you’ll find it in the trunk. Pop the trunk and you should see a compartment held by 3 straps. Un-strap those and you should see the windscreen, hopefully in good shape. Does the car have a removable hard top? If the car you’re looking at does not have a hard top, you will have to find one that fits. The roofs for all R129s are not entirely interchangeable. Late model SLs have a much larger seal around the A-pillars and windshield surround. Does the car have a panoramic roof? You’ll notice the very top is black and the rest is body colored. If the car is black, you’ll probably have to jump in to notice. Regardless, you can tell the difference in the hard tops from the outside. 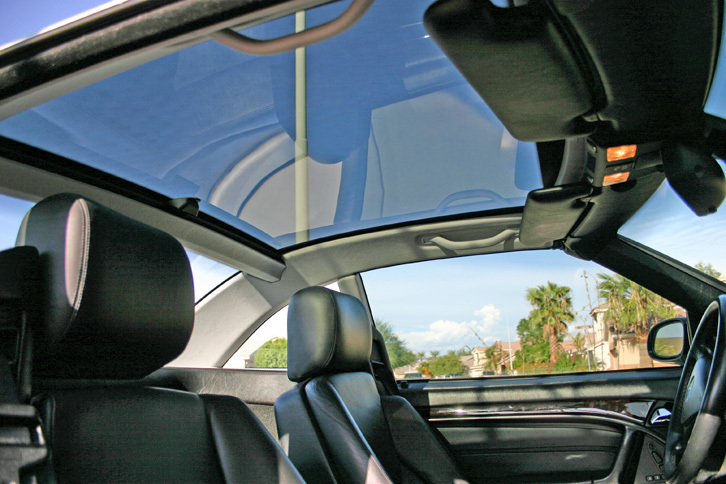 The panoramic roof has a more round and much smoother shape to it. Having the roof from the beginning is a huge plus; Buying the roof afterwards can cost anywhere from $500 - $2500 and you may have to match the paint and interior after that. I am not positive, but I think the panoramic roof is only compatible on model year 1995+ because of the seals. When you look at the car you should always work the soft top and rollover bar several times and check for hydraulic leaks at the front A pillars by the visors and at the pistons that lift the top and soft top boot. In my experience the tops that are not exercised occasionally have a better chance of leaking. You can tell if the soft top is original by examining it; when you look close, you should see a checkered pattern. You can also test to make sure the soft top still works well by trying to pour some water on it and see if any water makes its way through the plastic window. The canvas top comes in two pieces and just the rear with the plastic windows can be replaced if needed. Check the high mounted stop light (the 3rd brake light) for function. If it does not work there is most likely an open in the wires at the right side trunk hinge. In two cases I have found the brake lights were stuck on because of a “short” had a cured instead of an “open” at the trunk hinge wires, and it melted wires together way into the wire loom up by the drivers left foot rest. Also have found on early V8 cars the alternator wire harness can chafe on heat shields when the engine mounts are collapsed from age. This can lead to serious alternator and electronic control unit failures from voltage spikes and short circuits. Does the car have any non-standard packages? The SL600 includes should include all options standard. If the headlights aren’t Xenon, maybe they were replaced because of an accident. For other vehicles, you’ll want to see if any packages were included. There are two main packages: SL1 package which features an AMG body kit (bumper, side skirts) and 18 inch AMG alloys with sport tires. The SL2 package offers Xenon headlights and heated seats. Is the car a special edition? There are several different special editions of the 129-body SL. These could significantly affect the long term value of the car. It’s possible the owner doesn’t know what they have. Here is a list of the editions to keep an eye out for: Mille Miglia Edition, Designo Edition, 40th Anniversary Roadster Edition (1997), Special Edition (1998), Final Edition (2000), SL Edition (2000), Silver Arrow Edition (2002). Click here to read more about the different special editions. Is the car an AMG model? Inspect the car closely, because it’s easy to buy AMG badging and put it on the car, and it’s easy to buy AMG wheels. An AMG is distinguished by its hand-built engine with a distinctive serial number a badge on the engine signed by the builder. There are only four types of AMG-modified SLs and they are rare. The SL55 (65 units made), the SL60 (633 units made), the SL70 (150 units made), and the SL73 (42 units made). Most of these cars live in Europe. 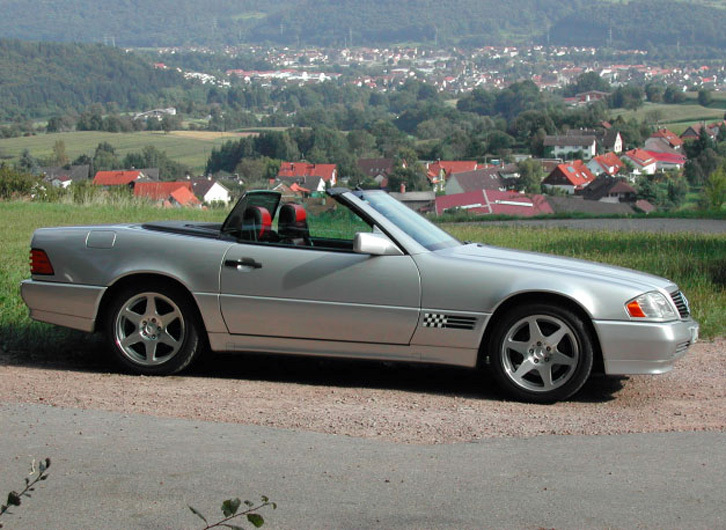 Keep in mind that only 204,940 total units of the R129 SL were made so the AMG models are extremely rare and valuable. If the buyer is questionable, most likely it’s not really an AMG original. were the first to have the new designation. For example, 500 SL is now SL 500. 17-inch wheels standard: Wheels are now 8.25 x 17" with 245/45ZR17 tires. Sport package is 8" (front) or 9" (rear) x 18" with 245/40 (f) and 275/35 (r) tires. 4-speed automatic standard, 5-speed automatic standard from 1996. What models are available here in the USA? All of the cars listed above did make it here to the US with the exception of the SL280 and the 12 valve 300 SL. Also note that starting with model year 1998, 6-cylinder models were no longer offered here in the US. Now I have been dancing around a 129 car without much comment, the V12 Roadster. First off let me say that all comments are from a mechanics point of view. The V12 is a car that “only a mother could love”. The early 129 V12’s were very problematic from an emissions stand point (ck engine light). These cars were a never-ending source of work for my shop. Not to say I made any money (because I didn’t) but they sure kept me busy! From wire harness problems to oil leaks it was just a bad design. Now don’t get me wrong from the driver’s seat this is one of the most awesome cars in the world … when all is right. The feeling of acceleration from 30 mph to 90 mph is the same as from 90 to 140 mph! This car pulls hard though-out any speed range and the 129 chassis handles it well! Now I will mention just a few of the problems this car will have. Oil leaks are a problem. Because the 120 engine shares the same right bank cylinder head configuration with it’s little brother the 104 engine it stands to reason it should also have the same oil leak, the front cover. After a while if left unattended it will soak the right side of the engine ruining the alternator and any coolant or air hoses in the vicinity. The intake manifold will have to be removed to get to the valve cover gaskets to remove the front cylinder head cover. Updated intake gasket spacers will be needed along with just about every rubber air or crankcase vent hose and all vacuum hoses. Oh and did I mention that you have to disconnect the engine wire harness from al the sensors and injectors? Wow, look at all those cracked wires. Now that’s just one oil leak. I normally refer to the check engine light as “my friend”, but on the 1992 though 1995 V12 it is my worst enemy. From plugged EGR ports in the intake manifold to carbon fouled air injection ports in the cylinder head, there is always a place to start and never a place to end. If you are thinking of buying any V12 you had better be willing to devote allot of resources into keeping it in good shape. You can now find these cars for under 10k so don’t be fooled into thinking your getting a good deal. Now remember this is from a mechanics point of view, I can only imagine the owners. If you'd like to translate any of this content, please feel free to do so. You can also contact me and I'll post a link here to your translation. Special edition of 2002 SL 500/SL 600 made to celebrate the race car with the same name (from 1930). Two-tone interior leather on steering wheel and seats, special wheels, etc. 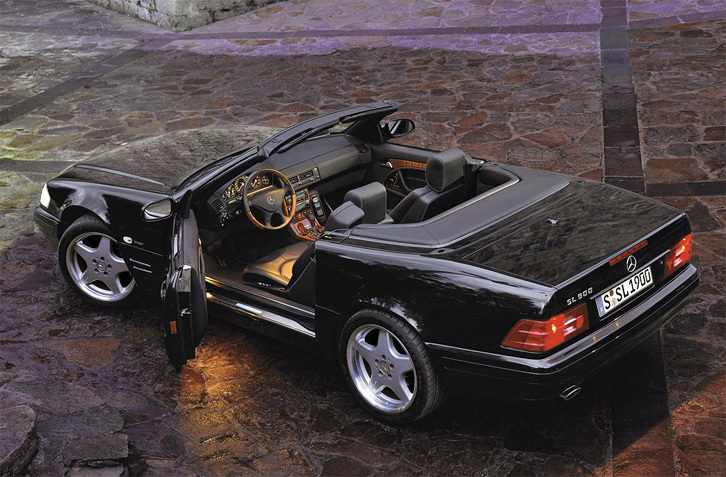 For the US market, only 1550 Silver Arrow units were produced; 100 units of the SL600 and 1450 units of the SL500. This edition has special Silver Arrow ultra-metallic paint; fully-lined black soft top; brushed aluminum instrument cluster; black bird's eye maple wood trim; and aluminum trim on the wind deflector, shift gate, pedals, grille and trunk lid. 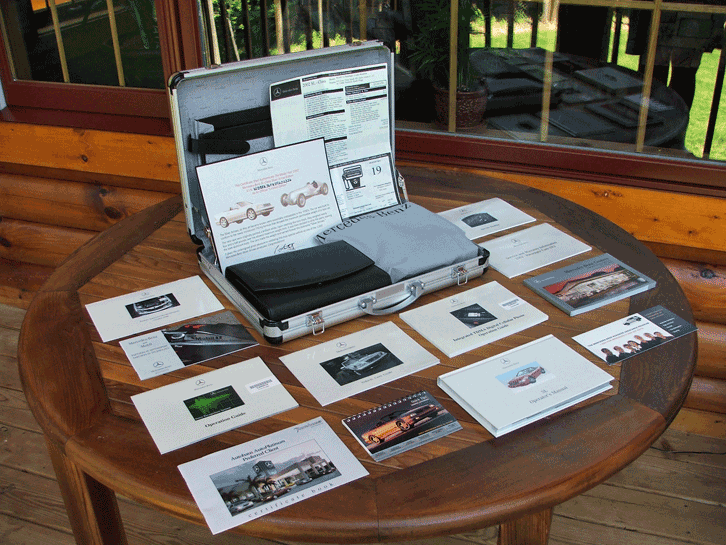 In addition, unique mechanical components include: 2 piece six-spoke 18-inch alloy wheels; factory cross-drilled brake rotors front and rear; Xenon headlights; a six-disc CD changer; and an aluminum briefcase delivery kit. 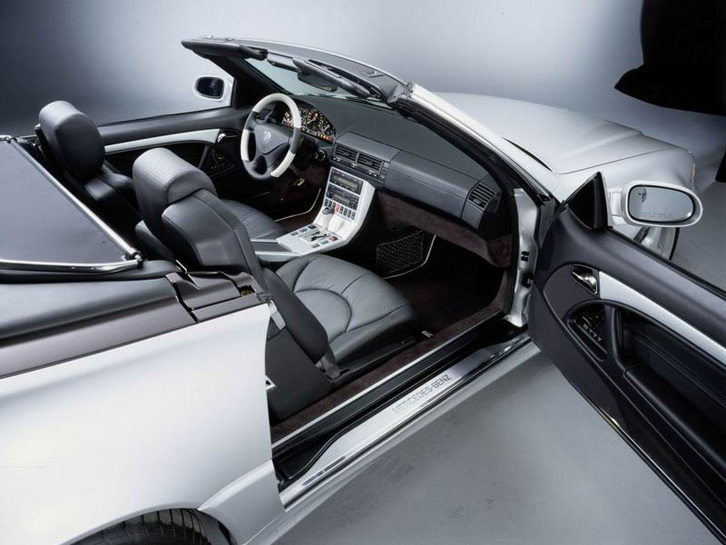 The SL 600 Silver Arrow received black leather upholstery with silver perforations, a combination leather/black bird's eye maple steering wheel and shift knob, plus a Panorama hardtop and multi-contour sport seats. In 1995 Mercedes released the Mille Miglia edition, to commemorate the 40th anniversary of Stirling Moss's win of the 1955 Mille Miglia road race. The limited edition was available in either SL320 or SL500 guise, came in Brilliant Silver metallic, and had Evo II six-spoke polished alloys, red and black leather interior, carbon-fiber trim and extra equipment. Stirling Moss was given the first Mille Miglia edition SL500 built. The "La Costa" SL was constructed in 1997 to commemorate Mercedes-Benz's sponsorship of the "Mercedes Championship" PGA golf tournament at the La Costa Resort and Spa played January 6-10, 1997. 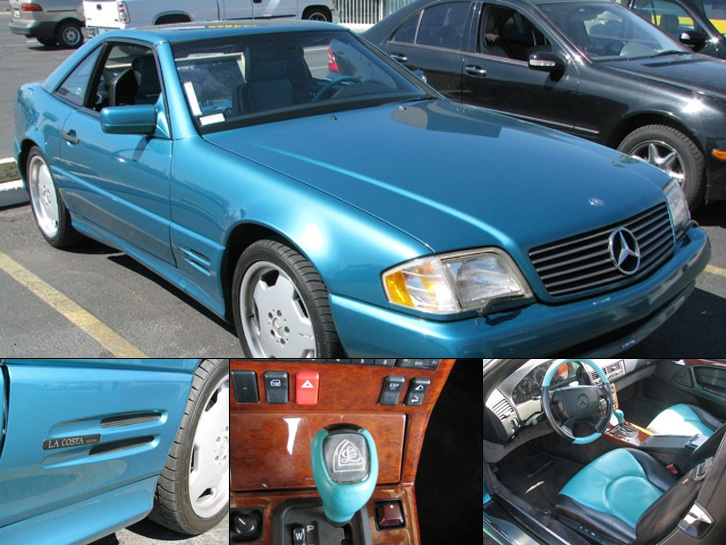 Announced January 10th, 1997, the $5,000 package included the AMG "Sport" package; special calypso green paint; black and calypso green leather; special badging and gearshift insert; eucalyptus wood trim; custom floormats; heated seats, Xenon headlamps and multi-contour seats. Commemorates Mercedes-Benz returning to Formula 1. Many of the details that went into the Silver Arrow are present on this edition. Silver Arrow paint color; F1 Edition side markers; Perforated black and silver seat cushions; Shift lever and steering wheel in contrasting Silver and Black; Silver painted "wood trim"; Stainless Steel grill; Silver (grey) soft top.